Sharks and rays have several differences from other fish. For one, bony fish have a specialized organ called a swim bladder that helps them swim, while sharks do not. However, sharks have several other methods of controlling their buoyancy and level within the water column. This includes several physical adaptations that have certain pros and cons when contrasted with swim bladders. While sharks lack a swim bladder, their liver can provide some of the same functions. A shark's liver contains high levels of oily lipids. This gives the shark more or less neutral buoyancy, meaning the shark has roughly the same density as seawater. Having neutral buoyancy relative to the seawater makes it easier for the shark to swim about the same level within the water column. Sharks also use their pectoral or side fins to control their swimming level. A shark's pectoral fins work like a bird's wings, allowing it to control its level within the water. When swimming, the shark's tail or caudal fin generates forward movement, and the fins generate lift by moving water more rapidly over the top of the fins than underneath, generating lift. Additionally, sharks can dive by pitching their pectoral fins forward. A shark's liver and pectoral fin offer several advantages over swim bladders. For example, a swim bladder can rupture if a fish changes depth too quickly. This limits how quickly a fish can change depth, or even how deep a fish can dive. A shark's liver does not suffer from this limitation, allowing sharks to swim to various depths more quickly without injury. 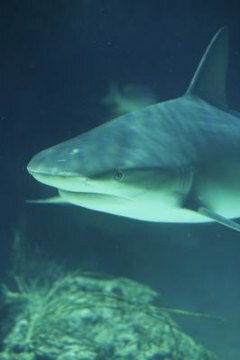 A shark's liver does have several disadvantages compared to swim bladders. Bony fish can adjust their swim bladders more precisely than sharks, allowing them more control of their depth. Additionally, this means that sharks have to spend more energy to rise or fall in the water, and they cannot hover in the water like many bony fish.